Submitted by Alexander Briones on Feb. 17, 2018. Originally published on Jan. 18, 2017 and most recently updated on Feb, 18, 2018. Adding a studio monitor subwoofer is a sure-fire way to improve your music production. Not only does it let you hear the lows more clearly, it also frees up your main studio monitors to better handle the mids and highs - the end result being better overall sound quality and clarity. Below we present you with our February 25018 updated studio monitor subwoofer recommendations, as determined by the latest user and expert reviews, ratings and forum discussions. In this update, we expanded the list of top studio subwoofers to five, which now includes the PreSonus Temblor T10 and the Neumann KH 805. Presented below are the Best Studio Subwoofers on the market, complete with detailed features along with a report on their pros and cons that we found in the many reviews we analyzed. Founded in 1986, KRK has grown to be one of the most familiar brands in near-field sound monitoring. They made it into this list with the KRK K10S2, a 160 Watt powered subwoofer with a 10" glass-aramid composite woofer, and a 2" voice coil. If features adjustable crossover with a sensitivity switch for better compatibility with other pro or consumer audio equipment, making this an ideal choice for those who want a subwoofer that can handle music production and leisure listening. For added convenience, KRK equipped this speaker with footswitchable bypass, and ground lift switch. Controls: Adjustable crossover, Sensitivity switch, Ground Lift and Polarity Switch. 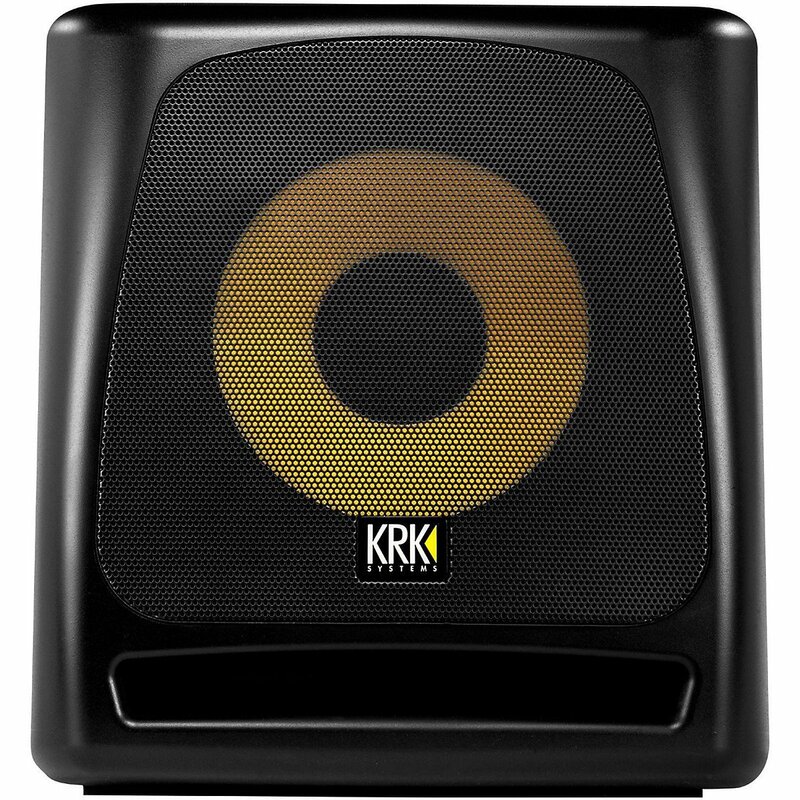 Dimensions: 15" x 14" x 16.06"
Many reviewers are overwhelmed by the KRK K10S2's power and accuracy, and they are impressed by how it can really get loud, in a good way. Producers are happy with how they are hearing the low frequencies better after adding this subwoofer into their setup, resulting in their tracks translating better when played on real-world systems. While some are happy that this subwoofer is loud, some find it too loud, to the point that it bothered their neighbors. Some reviewers also note that you will tend to want to listen to your mixes louder, with this on, which can be tiring to both you and the people around you after quite some time. The KRK K10S2 is meant for reproducing loud low frequencies, highly recommended if you're musical tastes require such a tool. 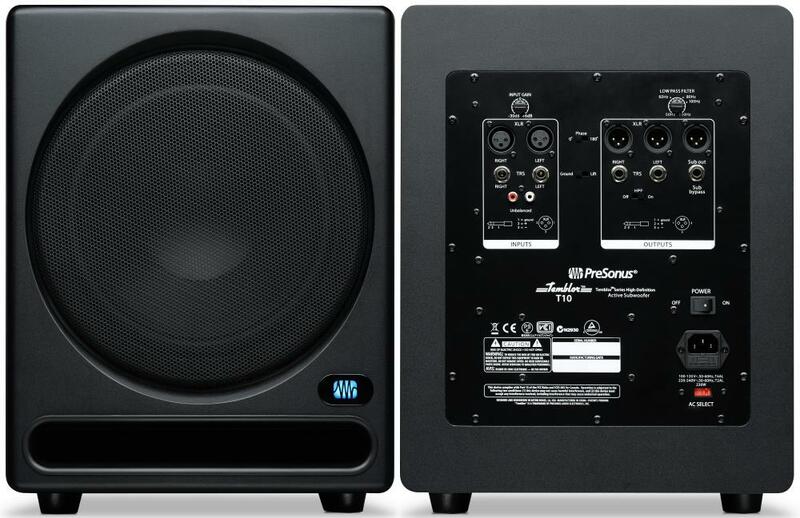 The PreSonus Temblor T10 subwoofer offers serious low-end that can fill small to big studios. It features a 10" woofer that's driven by 250 watts of Class AB amplification, which can be quite loud when needed. With its versatile input/output ports, the Temblor T10 is very easy to implement in home studio setups. It also comes with essential controls for easier matching with different main studio monitors, including an input gain, variable low pass filter, and high pass filter switch. Finally, the Temblor T10 comes in a nice looking forward firing profile that will easily fit into any room. Dimensions: 15.75" x 12.60" x 15.75"
One user summarized market sentiment nicely by describing the PreSonus Tembler T10 as "earthshaking". It impresses users with its loud yet clear low end, which makes listening to thumping bass easier. Even experienced users credit this subwoofer for the improvement of their mixes, specifically in tightening and smoothing out the low end. There are some who feel that the build is not as solid as they would like, with a few experiencing some rattling sounds. Other than that, the Presonus Temblor T10 is a good studio subwoofer for those looking for something bigger and louder. JBL needs no introduction, having been in the sound reinforcement business for more than 7 decades now. So it is not surprising to find the LSR310S in this list, a powered subwoofer with a 200W amplifier and a down-firing 10" speaker, designed specifically for studio monitoring use. 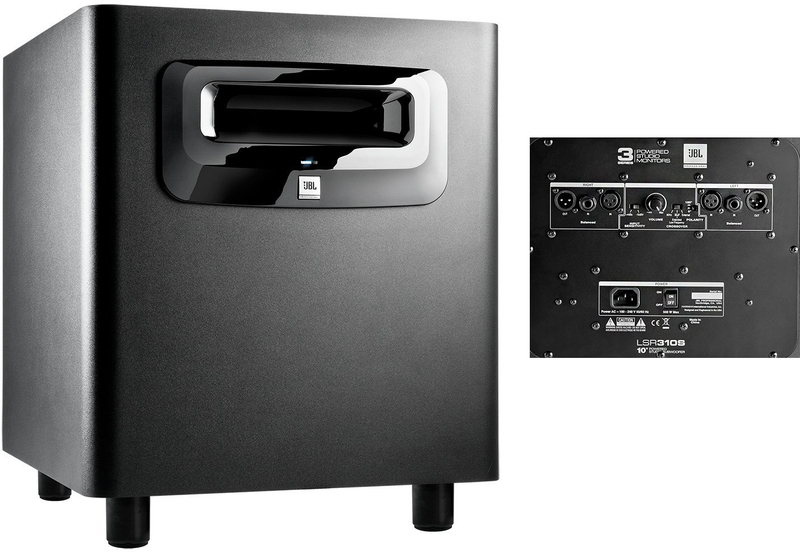 It features a ported cabinet design that improves bass response at low playback levels, and at the same time reduces turbulence to ensure clarity. Other features include selectable crossover settings and level control. Dimensions: 17.65" x 15" x 15.65"
One user put it nicely, the JBL LSR310S is physically and sonically imposing, and most of the reviews agree that it sounds much bigger than expected. Many describe it as having clean and tight sounding lows, and that it integrates well with the JBL LSR308, which resulted in a fuller sound that helped many with their mixing and production duties. Lack of overall volume came up a few times prompting other users to provide tips on how to better position or setup the unit for improved results. If you're looking for a quality subwoofer from a reliable brand, then check out the JBL LSR310S. 94 out of 100. Incorporating 150+ ratings and reviews. 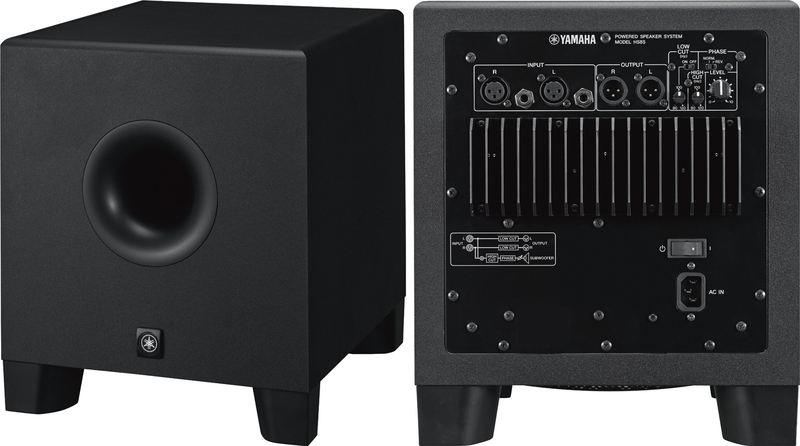 Yamaha's vast experience and machinery have made them a tough contender in the music gear market, and when they pull together their resources, you can expect top rated, high quality products, case in point is the Yamaha HS8S Subwoofer. Weighing in at just 27.6 lbs, this compact subwoofer is meant for home studio use, with just the right balance of power and quality, while taking up very little space. It has a 150 Watt amplifier that drives a relatively small 8" speaker, and features low and high cut filter switches that lets the speaker handle different types of music. Crossover Frequency: Can be adjusted between 80 Hz and 120 Hz. Input Connectors: 2 x XLR, 2 x 1/4"
Dimensions: 13.8" x 11.8" x 15.3"
The Yamaha HS8S continues to best its competition with its high rating, with many professing that it has the right combination of features for their home recording needs. From tight punchy bass to room rumbling sub frequencies, many are impressed with its versatility, with some of them commending Yamaha for adding adjustable low/high cut filters. The overall market response is that it does the job done nicely, well worth the money. There are a few experienced users who feel that the low frequencies are weaker at lower volume settings, but they do note that it works great in the mid levels. There are also some who found the volume to be lacking for bigger rooms. With its versatility and clarity, this space saving compact sub-woofer should be your first option. The Neumann KH 805 is easily the priciest studio subwoofer in this list, so it's not for the weak of heart when it comes to budget. But those who are willing to invest in the KH 805 will enjoy its premium build, sound quality and control flexibility. It features a 10" woofer that's magnetically shielded for ultra-quiet and clean lows, while the 160W (Continuous) amplifier provides enough juice for use in any home and professional studio setups. Other features include a bypassable fourth order 80Hz for easy compatibility with recording consoles and consumer sound systems, and it also has a good number of acoustic controls for adapting to rooms and matching with main monitors. Dimensions: 14.2" x 13" x 25.4"
Users have mostly good things to say about the Neumann KH 805, commending its clarity, deep lows and good projection, and how it retains them even at louder settings and during long mixing and production sessions. Its flexible control options also received a lot of commendations. Interestingly, there aren't any major complaints about this subwoofer, other than those who wish the price was more accessible. If you have the budget to invest in a premium studio subwoofer, then do check out the Neumann KH 805. The frequencies below the crossover are the ones that go to the subwoofer, and to get the best results the crossover frequency should be at the point where your main monitors start to roll off. Most studio subwoofers come with switchable crossover frequencies which makes integration and matching to your main monitors easier. This specification pertains to the frequencies that the subwoofer can handle. For casual listening you'll often want the lowest possible, but for studio monitoring, a slightly higher frequency response is preferred for better clarity, allowing you to really hear your recordings and make correct adjustments. Power rating dictates the overall loudness or volume of the unit. If you want to avoid tiring your ears while monitoring, or you prefer not to bother your neighborhood, you'll want one that has just the right volume to get the job done. In live sound reinforcement, the bigger the speaker size, the better the subwoofer will perform. But this is not necessarily the case for studio monitoring, while there are still those who prefer bigger speakers for the extra low end thump, there are many who go for smaller speakers with their added warmth and clarity. While subs are not as position sensitive as your main monitor, you still have to consider where you'll be putting them in your studio. The usual placement is on the floor, right around the center of your two main monitors, but there are no hard rules since studio rooms vary widely. It is best to try the speaker in different positions until you find one with the smoothest and cleanest sound. If you get floor reflections, you can place the subwoofer on a low stand. The goal is not to over-emphasize the bass, but to make it clearer and easy to listen to, so you can make correct adjustments as you mix and work on your tracks. We looked into all the studio subwoofers available from major online retailers in the USA and selected the ten models with the highest ratings for further analysis. For this update, we gathered the most recent ratings and reviews that are relevant and ended up with over 575 sources. All of these were fed into the Gearank algorithm, which gave us the scores that we used to select the top five which we featured in this guide. For further details on the Gearank process see How Gearank Works. If you have any questions or suggestions about studio subwoofers please post them in the comments section below. Today we removed the Mackie MR10Smk3 from the recommendations above due to a lack of availability. You can still read our Mackie MR10Smk3 Meta Review. Submitted by Jason Horton on Feb. 21, 2018. The following subwoofer was removed from our recommendations above when we updated this guide in February 2018: Behringer Nekkst K10S. Submitted by Mohit (not verified) on Aug. 13, 2018.